Decorate for your daughter's birthday party with our line of Barbie party decorations! This Barbie Candle Set (4/pkg) will make her smile with joy when she sees how her birthday cake is decorated. This inexpensive party supply goes the extra mile to make her birthday extra special. 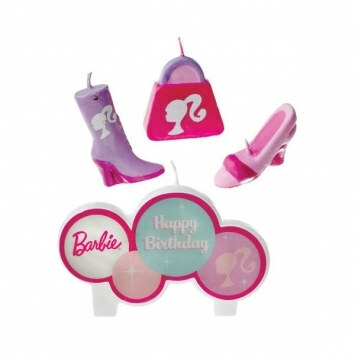 Each Barbie Candle Set includes four candles: one large candle that reads "Happy Birthday", and three small candles shaped like boots, high heels, and a purse. For more Barbie themed party decorations, check out our Licensed Party Supplies. One large candle measures 3 1/4" by 1 1/2"
Three smaller candles measures between 1 1/2"-2"